I am assuming by now most of you have seen the hilarious Dog Shaming site taking the internet by storm. If you haven’t, go there right now! I’ll wait. Isn’t that awesome? If you have a dog who has ever been naughty, Dog Shaming will make you feel better about him, or at least not so alone. Sort of when the kids were little and Ed coached soccer for them — sure, our own kids might have their bratty days, but all of these other kids? Well, our spawn is downright angelic in comparison. It’s good for the soul. Here is my own naughty boy, Teddy. Don’t let his fluffy frou frou princess looks fool you; he is an Olympic level counter surfer and has taught us time and time again to never place food within six inches of the edge. Sometimes we forget. 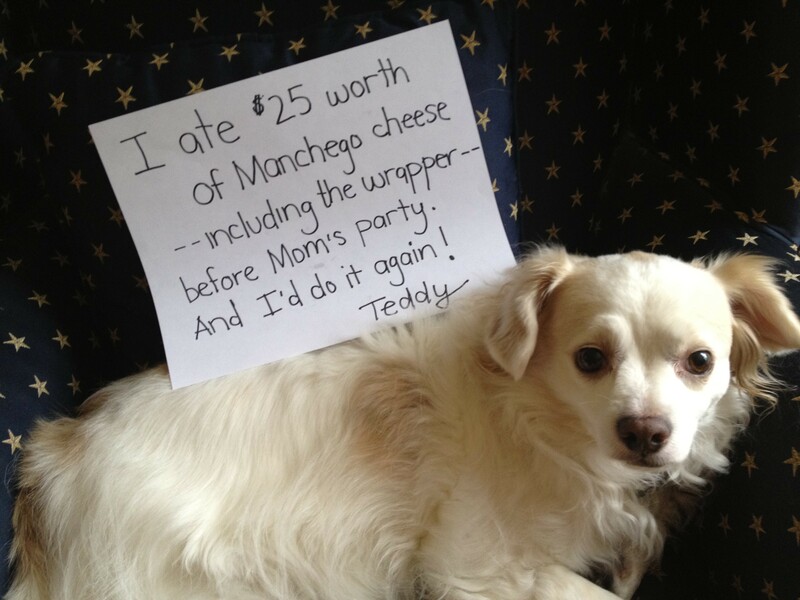 This entry was posted in Life and tagged Dog Shaming, Manchego cheese, naughty dog by Mom Mom's Apron. Bookmark the permalink. Well, he has good taste! U make me laugh! I like he ” I’ll do it again part” and I had never heard of this site before reading your blog. Love It! He looks so angelic but you can tell it’s a cover.